There is no director today as distinctive as Wes Anderson and I doubt there will be another film in 2014 that is as distinctive as The Grand Budapest Hotel. Wes’ eagerly awaited follow-up to Moonrise Kingdom is perhaps the most Andersonian movie the director has made. 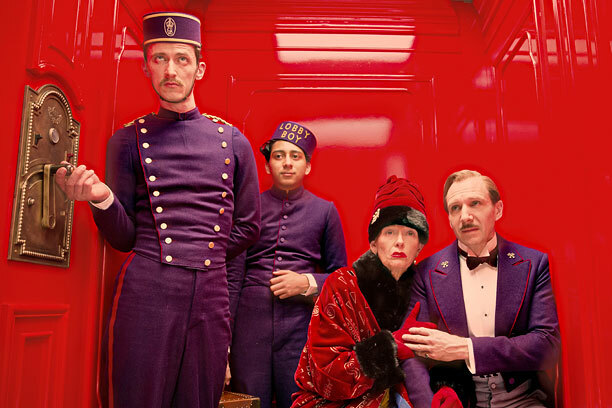 Part screwball comedy and part murder mystery (a throwback to Anderson’s small-time crime comedy Bottle Rocket), The Grand Budapest Hotel combines every Anderson trait, a large ensemble cast stretching from Harvey Keitel to Léa Seydoux, a color palette full of bright reds and oranges, and doll-house sets and art direction. It’s absurdly funny and incredibly complex, making it the biggest and most ambitious movie Anderson has done to date. No one can exactly do what Wes Anderson does and The Grand Budapest Hotel is one of the filmmaker’s best pieces. Set in the fictional country of the Republic of Zubrowka, located in the European alpines, The Grand Budapest Hotel is built off of multiple timelines and stories. To set up this lengthy plot summary, the narrative is told by an unnamed author (Tom Wilkinson), who recalls when he visited the Grand Budapest Hotel in the late 60s (his younger self is played by Jude Law). Once a glorious establishment, the Grand Budapest Hotel has fallen onto hard times and its previously bright painted walls have turned into dull grays and browns. There, the author meets Zero Moustafa (F. Murray Abraham), the owner of the Grand Budapest Hotel. Curious to why Mr. Moustafa would want to keep the hotel, the writer asks him how he came to obtain the establishment. Then Mr. Moustafa recounts his time as a lobby boy in 1932 (played by Tony Revolori) where he worked under Monsieur Gustave H. (Ralph Fiennes), the exuberant and womanizing concierge of the Grand Budapest. After Madame D. (Tilda Swinton), one of the hotel’s most frequent guests, passes away, Monsieur Gustave discovers that she has left him in her will the painting “Boy with Apple,” which is worth a fortune. Her son Dmitri Desgoffe-und-Taxis (Adrien Brody) is in disbelief that her mother would give Gustave the picture and thinks that he had something to do with her death. He has J. G. Jopling (Willem Dafoe), a tidy bounty hunter, to capture Gustave and take the painting for himself. The story may be a bit hard to follow, but that doesn’t really matter in The Grand Budapest Hotel. What does is the symbiotic connection between the characters and the mutual trust between them, such as Gustave-Zero’s teacher-student or father-son relationship, recalling Max Fischer’s friendship with Herman Blume in Rushmore. A common criticism of Anderson is that his films are often shallow on emotion and while he most certainly isn’t a director of sentiment, his characters aren’t cartoons. Love, life, and liberty all play roles in The Grand Budapest Hotel from Gustave’s loyalty to the author’s wide-eyed fascination. Anderson’s cinematographer Robert Yeoman, who has worked with the director since Bottle Rocket, photographs The Grand Budapest Hotel with a unique eye for culture, switching from wide to full screen once the picture goes back to the 1930s. Like every Anderson picture, there’s much intricacy in the design and shape of the worlds his characters inhabit that even the little details matter, like the signs plastered on the sides of the hotel walls or the Sovietesque uniforms Zubrowka soldiers wear. It’s impossible to credit a Wes Anderson movie without praising the cast and much like Anderson’s previous ensemble pictures like The Royal Tenenbaums and Moonrise Kingdom, the actors are all in top form. Fiennes is charismatic as Gustave, using his charm and endearment to play out comic lines. Adrien Brody is terrific as the picture’s snide villain and Willem Dafoe sends up his past roles as a psychopathic serial killer, proving to be a talented comic actor. Anderson regulars Bill Muuray, Jason Schwartman, and Owen Wilson make brief appearance but steal scenes in their few moments. Newcomer Tony Revolori also is a great find for Anderson, acting as the straight man to Fiennes’ eccentricity. Showing once again that he’s both an expert in comedy and drama, Wes Anderson provides 2014’s first fresh breath of air with The Grand Budapest Hotel, which met my very lofty expectations. I’m eager to see what Wes has planned next. « Should Movie Theaters Turn Their Sound Down? Really glad you liked it mate, I thought it was fantastic. A little hard to follow as you say, but it’s just so much fun and never lets up. Thanks! It was a lot of fun and it never grew boring. Great review! I respect Wes Anderson a lot and am glad he has another hit on his hands. My favorite film of 2014 so far. I’ve only seen Non-Stop and Noah besides Budapest thus far this year but this is easily the best of three. I wouldn’t be surprised if this made my top 10 of 2014. So much whimsical fun here, that only Anderson himself could deliver. Good review. Thanks! Anderson is great at making quirky slapstick comedies. Thanks! Fiennes was particularly great. I hope he has another role in a future Wes Anderson movie. Glad you love this one too! I really enjoyed this one, you’re right it has the right mix of comedy & drama, it was quite emotional to see the scenes w/ the older Zero. Fiennes is fantastic in his rare comedic role, hope he’ll do more like this in the future. I’m curious to see what Wes’ll do next! Thanks! I’d love to see another Wes Anderson movie with Fiennes, I’d really like to see him in another role like this. One of 2014’s best films thus far. I would’ve placed it at #1 but then I saw Enemy with Jake Gyllenhaal. I’ve only seen a few 2014 movies thus far but this is easily the best I’ve watched thus far. It did not disappoint. This movie is absolute perfection, and I’m not a Wes Anderson fan. His style is definitely distinctive, and I’ve always appreciated him for that. Going to see this for a second viewing! Absolutely stunning! I’m a big Wes fan and I loved this as well. This probably one of his more accessible pictures, which is strange since it has the most Andersonian feel to it. Same here mate. Well done; really enjoyed reading this. Almost as much as watching the movie! Also loved this film and already saw it twice at the cinema. Beautiful to look at and filled with amazing acting, beautiful symmetry and a story which never has a boring moment.